Back in my country Kenya. At least I can understand what people say here, no more Portuguese. After an intense trip you look at all the things from a distance. Gives a kind of air in the head, makes you want to write. In the plain I had an interesting conversation with a Somali Kenyan who had just met Morgan Tsvangirai, the Zimbabwean opposition leader, being in Pretoria, South Africa for a while. The man was proud of a present he got from the Zimbabwean and showed me Tsvangirais biography and his autograph inside. The situation in Zimbabwe must be terrible at the moment, more than a million people in camps, food shortage. Tsvangirai is going to change the situation, hert had told the Kenyan travel companion. ‘I will invite you for my inauguration’, he had told full of confidence. 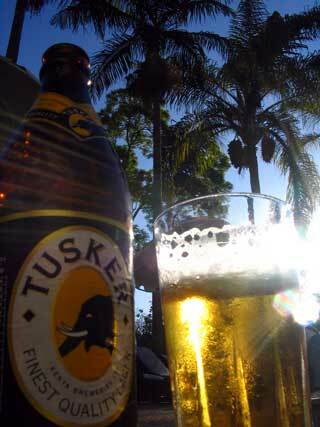 Arriving home I had a cold Tusker with my friends.